Music On The Street is a weekly series where OMN talks to local people and personalities about their relationship with music. Music matters and we want to hear about the music that matters to you! 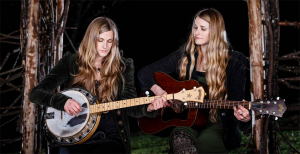 Talented musicians, and identical twins, Laurie and Katelyn, play really cool indie folk music and believe in the magic of a very large wooden egg. Now this is something that certainly fits with the variety of musical bands and acts that are uniquely Portland. 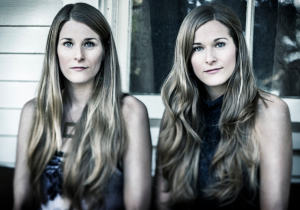 Music on the Street talked with the Shook Twins via email about why music matters to them. What role did music play in your life growing up? Music was always a part of our lives. Whether it was choreographing dorky dances to Enya and Janet Jackson, or memorizing songs for choir since the fifth grade, we were always singing. I love the way the music can bring you right back to a certain place in the past. When I hear Enya, for example, warm summer air is flowing through the house I grew up in and I am with my best friend Darian and we are making up a dance or hanging out with our guinea pigs without a care in the world. Good times. How did you get to this point–what was your path? We graduated with Bachelor’s degrees in Radio TV Digital Media Production from University of Idaho in 2006 and never got a “real job.” We just started playing more and more music. We started adding friends to the band and expanding our limits. We started working with our friend Phil Einsohn as a booking agent. He booked our first tour in 2007. We were both new in the game and we grew together. He became our manager after we moved to Portland, Oregon in 2010 as a duo and started making a name for ourselves. We gathered more band members once more and again expanded our limits. It keeps growing as a career and in quality of music and fans. We just keep going and it seems to be working out for us. We are very thankful for our gradual success and reassurance from our amazing fans. Did you know this was what you always wanted to do? We didn’t always know that we wanted to be indie folk musicians. We knew that we loved to sing. We had an amazing choir teacher for middle school and high school, Mr. John Brownell. He made singing very fun and team-like. We were huge choir nerds. Back then we thought that we wanted to be the hosts of the Travel Channel and have our own show called “Travel Twins.” Then we realized that we don’t like being on TV. Writing songs and playing them for people just seemed right. It came naturally and so we went with it. We love when random people come up to us, (mostly after shows, but sometimes in the grocery store or something) and say “I love you.” We say “We love YOU.” It’s sure nice to be loved. I also love being able to give back to the places that I get to travel to. It’s wonderful to have a purpose out there on the road: to make people feel good things. I love getting lost in a song and remembering why I wrote it. Sometimes they take on different meanings. We love it all – well, almost all of it! Sometimes it’s too much. And in a way we are selling ourselves to fans and industry folks. That’s the unnatural part. We are bad saleswomen. It’s tiring. It’s overwhelming. Sometimes we want to just stay in one spot for a long time. But ain’t it a blessing to get to do what you want to do?! How would you describe your music and what do you hope people take away from your music? We describe it as Indie Folk Pop with some twists. There are definitely some weird things that we do like beat boxing, looping, giant egg shaking, operatic solos, chicken bocking, telephone microphones. We hope that people feel like they hung out with their homies in the living room or on the front porch. We hope they leave the show feeling uplifted, blissed out, and comfortable in their own skin. How do you find the music scene in Portland? Elsewhere? Portland is wonderful. Plenty of musicians and audience members to go around. The musicians support each other, and the audience members are loyal and respectful. Sometimes we wish Portland would dance more though. There are some very enthusiastic music scenes here in the ol’ US of A. Colorado is killing it. Such stoked audiences. How do you grow your brand these days? Facebook and Instagram are great tools to show our fans what our travels and lives are like with artistic, thoughtful photos. We really enjoy that. Also it’s been great to team up with some conscious companies like Ninkasi Brewing Company and Hydro Flask water bottles. They have offered co-branded merchandise for us to sell. We pump them up and they help us out too! How does the egg add to who you are, and what you are about? The egg came to me from a young man outside a Hockey concert in Seattle in 2010. When I inquired about the giant golden egg, he told me that he got it from some lady who told him that he must sign it and then pass it on to the next person and so on… I wanted it. I signed it and took it home with me. It sat magic-ing up my home for several months until the idea came to me to make it musical. So I shoved popcorn kernels into the tiny hole on the top of the egg and voila – it was a giant golden EGG shaker. Then Katelyn had the idea to put a little contact mic on it and make it a drum. It is now a key part in a couple Shook Twins songs and travels the country with me and playing shows with us. I soon began to wish that the person who started this egg would reveal themselves to me. It was after a show in Seattle last year that we finally got another piece of the EGG puzzle. It was Kipp Galager and his 3 friends that started the signing and passing journey of the egg. They were gifted the egg from a “hipster Mad Hatter” outside of Dicks Burgers on Capitol Hill in Seattle in 2008. The “Mad Hatter” told them that the egg was magical and that it will grant wishes. He then embraced them all and told them to close their eyes and make a wish and to wish very hard. It was Kipp’s wish to be able to keep the egg and it was my wish to find Kipp. Kipp and his 3 friends kept the egg for 2 years loving it as a family member. When they were graduating college the four friends decided to pass the egg along just as it was passed to them, but added the sign it and pass it on tradition. Later, Kipp and I were connected to Lucia Neare a performance artists in Seattle who put on a street performance starring 30 chefs carrying giant golden eggs. Those chefs passed the eggs out to the audience and told each person to make a wish. Perhaps one of those audience members was the “Hipster Mad Hatter.” Lucia is an amazing woman who put unmeasurable amounts of love and magic into these eggs and I am so happy that one ended up with me. I plan to pass it on someday. I assume I will know when it’s right. There are no rules to the egg, just magically granted wishes and so much LOVE. The egg is also a symbol for us as twins because we came from one egg. It is my manifestation of magic and helps me believe that magic is real, which it is. In the egg, in the way we live our lives, in the people we love and lose, the world, everything and nothing.